Sometimes in magic a name is so intriguing you just want to learn more. Such is the case with Long Tack Sam. I first encountered Sam by seeing one of his posters in a magic book. The poster was colorful and his name just made me wonder what his act could be like. Was he another William Robinson who pretended to be oriental or was he the real deal like Ching Ling Foo? It would be a long time before I would actually have those answers because the book that showed his poster didn't really tell anything about Sam, and I couldn't find his name anywhere else in my small library of magic literature at the time. Fast forward to 2003 when news of a documentary on the life of Long Tack Sam catches my attention. I think it was 2004 when I was able to get a copy of the documentary. It was created by Ann Marie Fleming who just so happens to be Sam's great granddaughter. What a treat this documentary was. She shows you the journey she went on to discover her great grandfather and it's amazing. Frankly, Ancestry.com should sponsor her movie and show it on their website! Anyway, back to Sam. 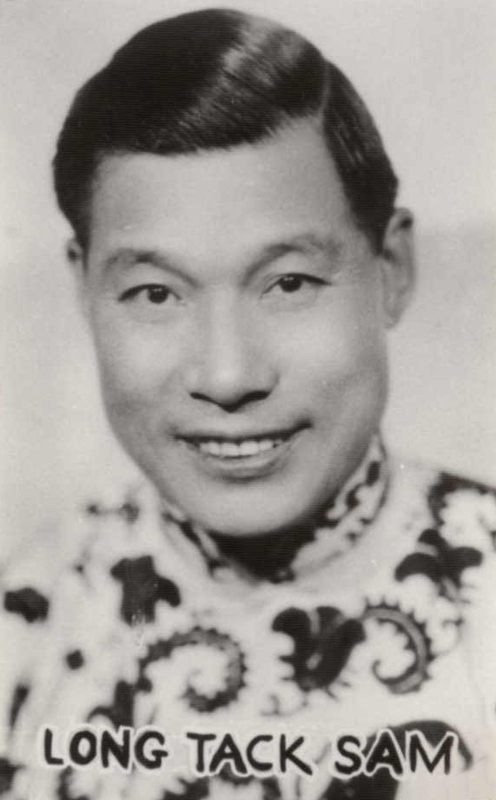 He was born September 16, 1884 in Northern China. There are conflicting reports of his childhood, so it's hard to know which one is true. One version of the story has a young Sam apprenticing with a Chinese Magician named Wang for six years. After that period of time, Sam had learned two tricks, the Linking Rings and the Rice Bowls. He left there and went out to work as a magician in Shanghai where we eventually joined another performing troupe. Another version of his earlier years has Sam being trained in acrobatic techniques by his brother and Sam eventually running away from home. Whatever the case, he eventually left China probably working with a western circus. In time he would become part of The Tan Kwai Troupe and Sam became the director. The name of the show would change several times until he finally decided to use Long Tack Sam. Apparently his real name was Lung Te Shan or possibly Lu Te Shen. But he chose Long Tack Sam as the stage name for his troupe. His performing trip were made up of acrobats, jugglers, dancers and he did the magic and also comedy. By all accounts he was a marvelous impressionist and mimic and could apparently copy the dialects of many languages including: Yiddish, French, Italian, German, American, Australian and probably more. The magic that Sam included in the show consisted of the Burnt & Restored Turban, the Linking Rings, The Needle Swallowing Feat and Rice Bowls. 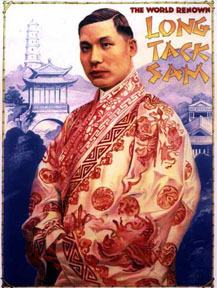 But his stand out trick was one that other 'oriental acts' had presented, but not in the dramatic fashion that Sam did. This description is from MAGIC: A Pictorial History of Conjurers in the Theatre by David Price, "Long introduced his amazing bowl production. The trick performed as part of a flip sometimes called a somersault in the air performed without touching the hands to the floor. After the flip, he had the bowl of water with fish in his hands". However, a newspaper from the times describes the act as this, "Instead of making a head-roll over before showing the bowl, Long Tack Sam did a hand-spring, which makes and causes the trick to appear to be much more difficult." So perhaps Sam had multiple ways of presenting the trick, but all included some feat of acrobatics just prior to the producing the bowl and it was more dramatic than anyone else who was presenting a bowl production which is why his stood out above all others. On Sam's first visit to the U.S. his troupe got to open for the Marx Brothers at the Palace Theatre in NYC. Prior to coming to America, Sam had married a woman from Austria. As WW1 broke out all over Europe, it made travel to Austria impossible. It also made it impossible for his wife and daughters to come to America. Sam has two daughters, Mina and Nepoldini, who eventually become part of his act in the later years. They go by the stage names Meena and Neesa. Neesa has a special gift of playing the violin that is incorporated into the show. Daughter Meena dances in the show and assists Sam during his presentation of the Doll's House Illusion where she magically appears from a tiny Doll's House. In 1932, Sam and his daughters performed at the now famous Grauman's Chinese Theatre in Hollywood California. Long Tack Sam and his troupe are extremely successful and quite popular in America, Australia and China. Sam even invests in theatre property in China and two restaurants in London. Eventually, as age creeps up and life on the road gets to be too much, Long Tack Sam retired from show business. He was talked into coming out of retirement by Herman Hanson in 1952 to appear at the Boston Society of American Magicians Conference. He performed his fish bowl production and gave a lecture at the conference as well. And a few years later in 1958 he did return to the stage for one last benefit show for the Society of American Magicians in NYC. Sam was the Masters of Ceromonies, he was 73 at the time. Sam was in declining health in the last few years of his life due to an unfortunate car accident. He died in Linz Austria on August 7, 1961. Just to put Long Tack Sam into perspective, Orsen Welles considered Sam one of his mentors. Sam was friends with Dai Vernon, Max Malini, Nate Leipsig, Houdini and basically all the greats of his time. The legendary comedian George Burns said of Long Tack Sam, "The Greatest Vaudeville Act I'd ever seen." On the DVD 'The Greater Magic Video Library Volume 29 with Charlie Miller and Johnny Thompson', Charlie Miller demonstrates the Chinese version of the Cups and Balls that he learned from Long Tack Sam himself. One of the moves appears to be the exact move that makes up one of the key elements to the Roy Benson, Benson Bowl Routine. Finally, the DVD documentary The Magical Life of Long Tack Sam is a must watch. It's produced, directed, narrated and stars his great granddaughter Ann Marie Fleming. It is so rich with magic history and yet tells a wonderful story of her family ancestry and contains some elements that are heart breaking and some very joyous moments as well. It's amazing that Ms. Fleming made the documentary when she did because all of the magic people interviewed in the film: John Booth, Elaine Lund, Jay Marshall and Jackie Flosso are all now gone. I've seen the documentary numerous times and enjoy every viewing. I only wish there were more documentaries like this on our brothers and sisters in the magic world. We owe a huge thank you to Ms. Ann Marie Fleming for the wonderful job she did to bring her Great Grandfathers story back to the masses where it belongs.